Rank and position during Kosovo conflict: At the onset of the Kosovo conflict, Radosavljevic was Assistant Head of Special Operations Staff and member of the MUP Staff in Pristina. Later, he became Commander (overall head) of elite “counter-terrorism” units known as the Operational Pursuit Groups (“OPG”) within the Public Security Department of the MUP. At the end of the Kosovo conflict, Radosavljevic was the Commander of a police training center in Petrovo Selo and retained the rank of Lieutenant-Colonel within the MUP. Crimes committed during the conflict: Radosavljevic admits to being in charge of the police/military operation in Racak on January 15, 1999, which would later be judged a war crime and crime against humanity by the ICTY. Additionally, OPG units he supervised are suspected of killing dozens of ethnic-Albanian civilians in the Cuska massacre and are also implicated in the massacre of 176 prisoners outside of Istok. Some witnesses have asserted Radosavljevic’s direct involvement in these massacres. Bytyqi case: Radosavljevic remained the Commander of the Petrovo Selo facility when the Bytyqis were transported, detained, murdered, and buried there. The Bytyqis were buried atop the same mass grave where the 75 bodies had been previously buried during clean-up operations. Radosavljevic claims to have been on annual leave and absent from the facility during the Bytyqi crimes. Requisitions for the receipt of goods at Petrovo Selo signed by Radosavljevic during operative dates. Records indicating that his adolescent daughter visited Petrovo Selo during operative dates. Witnesses who have stated that Radosavljevic was not only present in Petrovo Selo, but actually received and passed on orders to execute the Bytyqis from Assistant Minister of the MUP and Chief of the Public Security Department, Vladimir Djordjevic. Djordjevic is serving 18 years in prison for war crimes and crimes against humanity committed during the Kosovo conflict. Over the last several years, Serbian prosecutors have suspected that Radosavljevic has actively interfered in the Bytyqi case, both intimidating and instructing witnesses. Positions after Kosovo conflict: Radosavljevic later became Chief of the PJP. In 2001, the PJP was renamed the Gendarmerie and Radosavljevic retained leadership over it, with the rank of General. In this position, Radosavljevic was responsible for the outside security of the U.S. Embassy in Belgrade and began a close relationship with Ambassador William Montgomery. Radosavljevic is now retired from the MUP and operates a security firm in Belgrade, where he provides training and security around the world. Political career: Since 2009, Radosavljevic has been a member of the Serbian Progressive Party. He is on the Progressive’s Executive Board and has been seen publically celebrating party milestones with Prime Minister Aleksandar Vucic and President Tomislav Nikolic. Significant accomplishments after the Kosovo conflict: In October 2000, Radosavljevic, as PJP Commander, declined President Slobodan Milosevic’s orders to deploy troops against protesters in Belgrade who were rallying against Milosevic’s efforts to steal Yugoslavia’s presidential election. 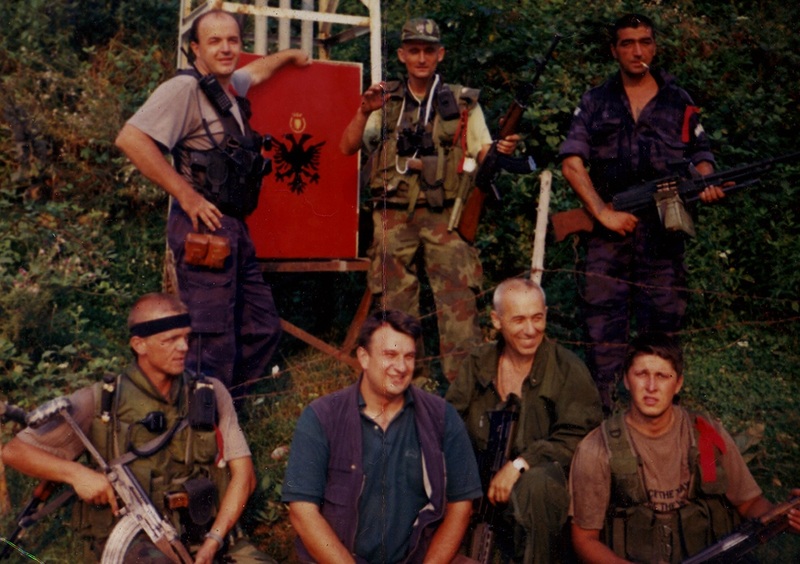 In the early 2000’s, Radosavljevic reportedly received a medal from NATO for showing restraint against ethnic Albanians who had taken up arms against the government in southern Serbia. In 2004, after fourteen months in hiding following the assassination of Prime Minister Zoran Dindic, Milorad Ulemek “Legija” turned himself in to Radosavljevic, now head of the Gendarmerie. Consequences of involvement in war crimes: Around 2003, the U.S. military and NATO considered approving Serbian troops for missions in Afghanistan. Radosavljevic was to lead these troops, but was essentially blocked from direct involvement after record of his complicity in war crimes in Kosovo were raised. After the 2004 election of Serbian President Boris Tadic, Radosavljevic was removed from his position in the Gendarmerie and made “adviser” in the MUP. Several months later, Radosavljevic resigned and left Serbia, living abroad and operating a security firm training foreign troops in Libya and other countries. Observers believe that his ouster and flight were partially caused by concerns over his involvement in war crimes in Kosovo, but mostly due to his political affiliations. Bottom line: Despite ample evidence of involvement in the murder of three U.S. citizens, other war crimes and crimes against humanity, and cover-up operations, Goran “Guri” Radosavljevic has never been seriously investigated or prosecuted. He remains politically protected by Prime Minister Aleksandar Vucic, President Tomislav Nikolic, and the political environment they foster that shields high-level suspects. Printable fact sheets on the Bytyqi case, current context, and Goran “Guri” Radosavljevic can be found here.